With the 308, your quest to find a great, long range round is over. Proven through years of military and government service, as well as plenty of civilian use, the 308 is a phenomenal cartridge for long range shooting. Able to take down most big game animals in the United States, the 308 is a popular and versatile cartridge. 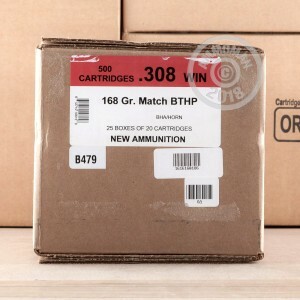 Black Hills is known for their high quality, accurate ammunition, and even the United States Military buys match grade ammunition from them for long distance competition shooting. 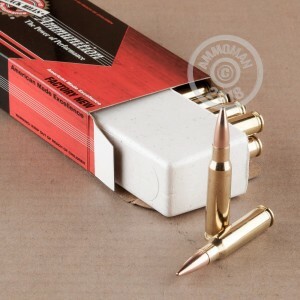 Each round in this box of 20 features a 168 grain hollow point boat tail projectile that leaves the barrel around 2,650 feet per second. 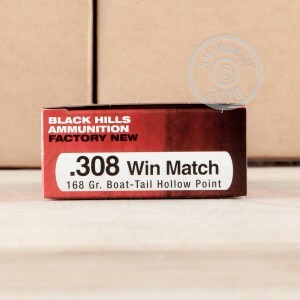 Black Hills loads these match grade rounds into fresh brass cases that are boxer primed and re-loadable. Do you need more than 20 rounds? At AmmoMan.com all orders over $99 will ship for FREE! So stock up and save!